I'm back with another project from our makeover of my teenage daughter's room. 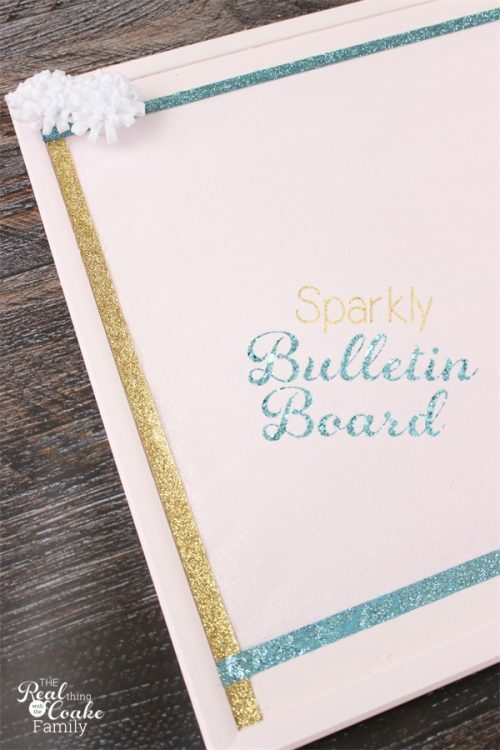 Today I'm showing you the step by step of how to take a plain brown bulletin board and add some sparkle and fun. 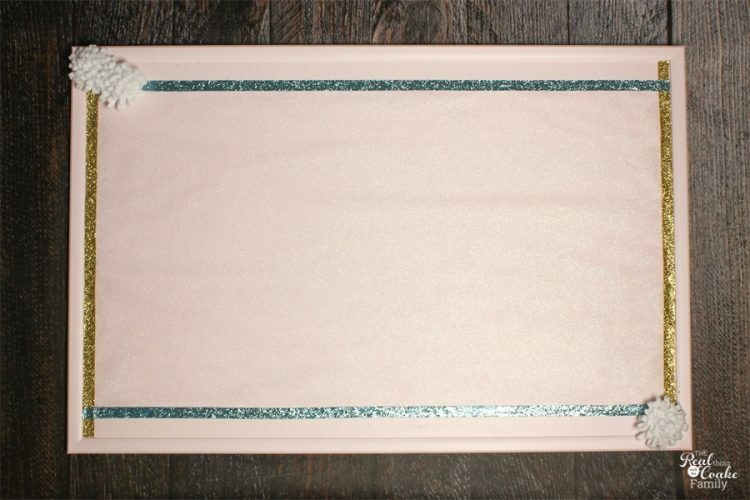 Perfect for a teenage girl's (or boy's…likely with different colors) room! In order to stay on budget with the makeover of my daughter's room, I have to re-use a number of things. Now we totally could have put the brown bulletin board back up on her walls, but I thought, “Why not make it cute first?” I know, for those of you who have been to my blog before, this does not surprise you. I had a little bit of the white sparkle tulle left from the sparkly bed skirt I made for her room last month. We really wanted to add more of the sparkly white tulle to her room because we love glittery sparkly things! Since I've been working Offray, they offered to sponsor this post and supplied me with the additional tulle needed to complete this project. 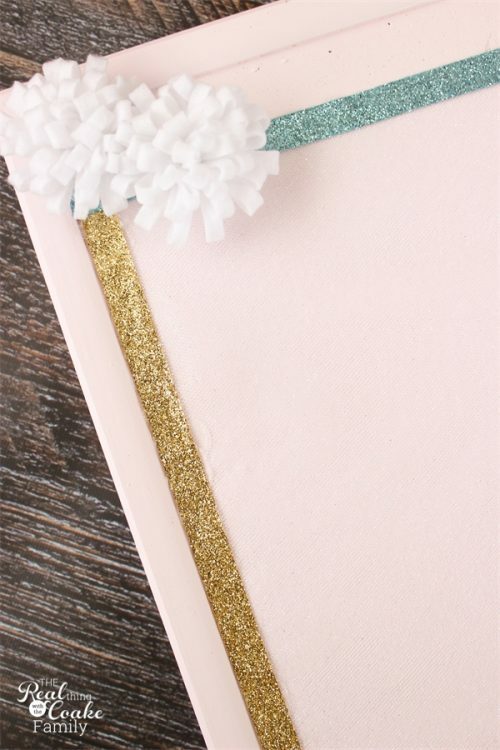 Of course, in the end we added more than just one of the beautiful Offray ribbons to the bulletin board…the more glitter and sparkle the better, right?! 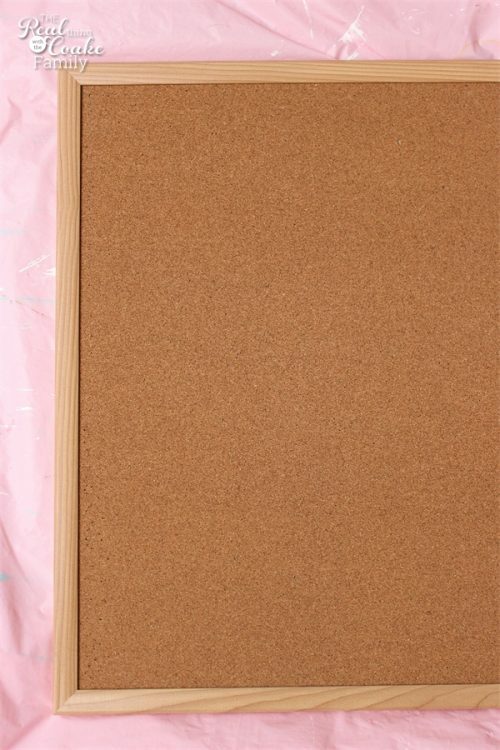 Start with a plain bulletin board in the size that you want for your space. 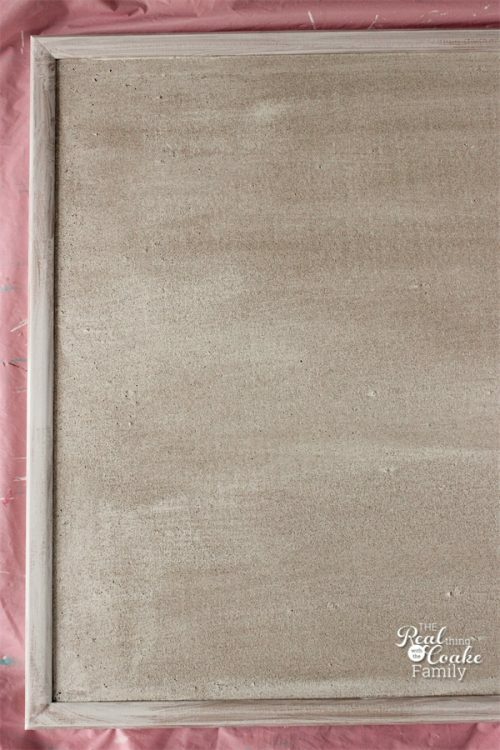 Use 150 grit sandpaper to scuff up the edge of your bulletin board if it has a shiny surface. This will allow the paint to adhere better. Prime the entire surface and edge with one coat of primer. Paint the entire surface with your selected color. We decided to use the same pink we used on her walls, which opening that paint was VERY interesting as I showed you on Instagram. I used 2 coats of paint on the cork portion of the board and 3 coats on the edge. 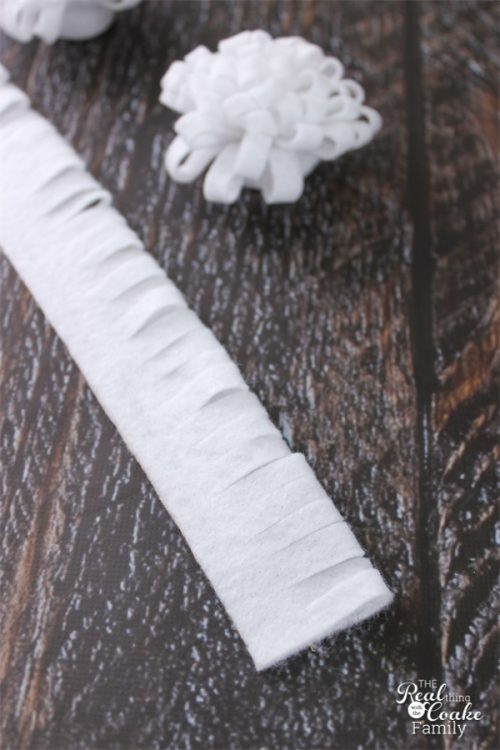 Now you will use the White Sparkle Tulle. I used the 18″ tulle. It comes on a roll, which makes it so easy to work with. I centered the 18″ on the bulletin board and used hot glue to attach it. 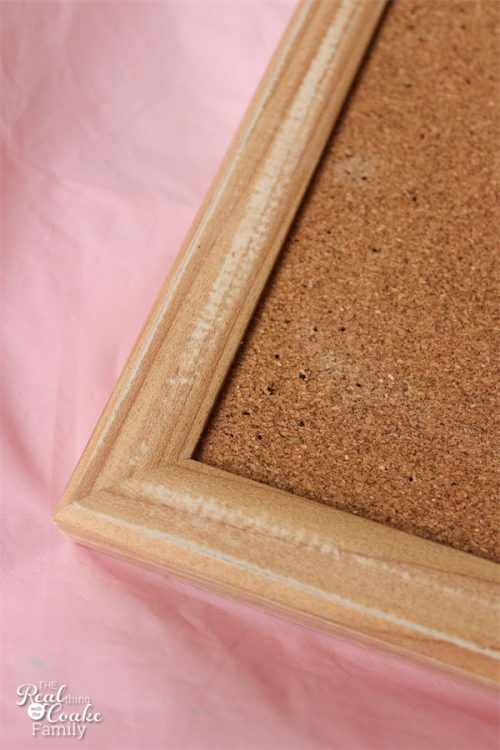 Of course you only want the hot glue at the sides so that you won't have space of glue in the middle of your bulletin board, which would not allow you to pin things in those spaces. (affiliate link) when working with hot glue…they will protect your fingers from the hot glue. Do a few of these on each side. See the flattened hot glue? Keep it a bit away from the edge of your board to make the next step a bit easier. 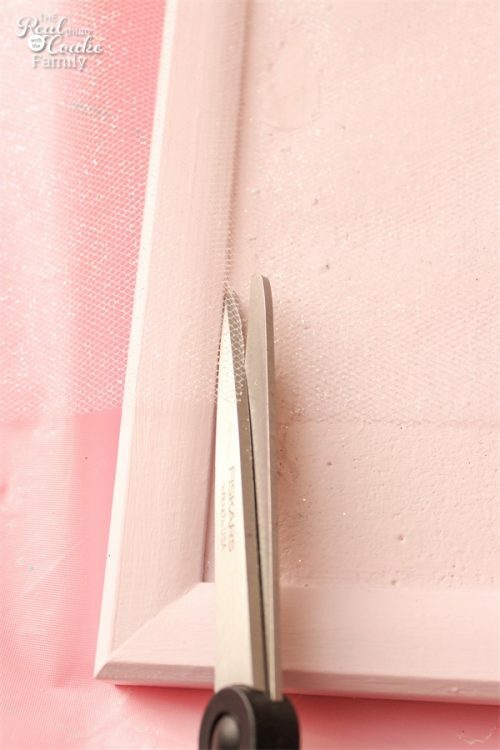 Using sharp scissors, cut the extra tulle off. You will be covering this, so don't worry if your cut is rather rough. Repeat this process 3 times. 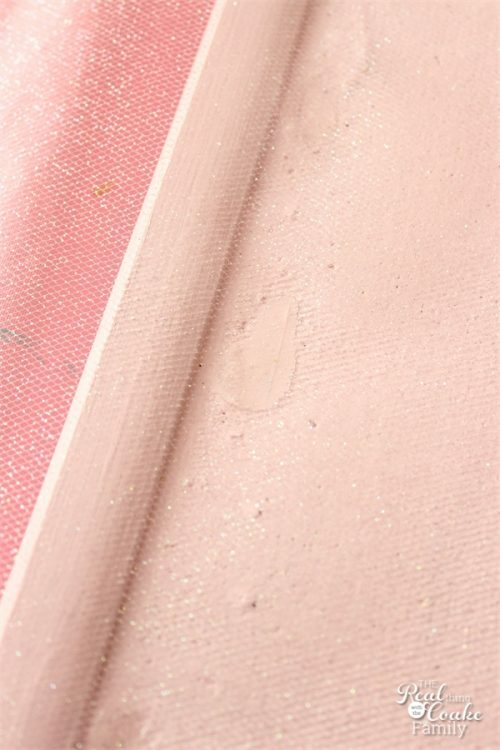 The three layers will allow the sparkle of the tulle to really shine through. Hot glue the Sparklet ribbon at the edge of your board to cover the hot glue to hold the tulle in place as well as cover the rough cut of your tulle. 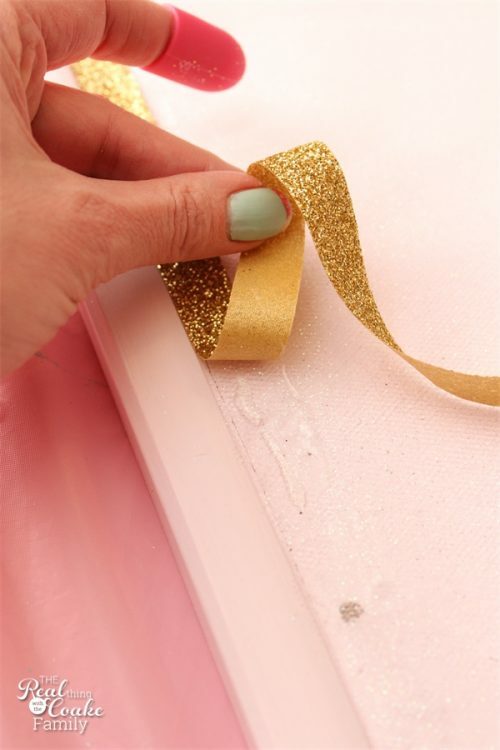 Add another line of Sparklet ribbon at the top and bottom of the Sparkle Tulle to hold the Tulle in place and add some additional color and sparkle. When we started planning this board, I mentioned adding some felt flowers in the corners. She told me in no uncertain terms how much she disliked felt flowers. Fast forward to a pillow I made her out of fleece and minky fabric (which I will show you soon). It had a felt style flower made out of fleece. She loved it and wanted a few on this bulletin board… Ha Ha…Mommy was right! I just had to gloat for a minute and share it with you as well. To make this style of flower, cut a 3″ x 16″ piece from felt or fleece. Hot glue it in half lengthwise. Cut small slits into the open (non-glued) side, as shown above. Don't cut all the way through. Roll the fleece/felt tightly and hot glue the end to hold it in place. 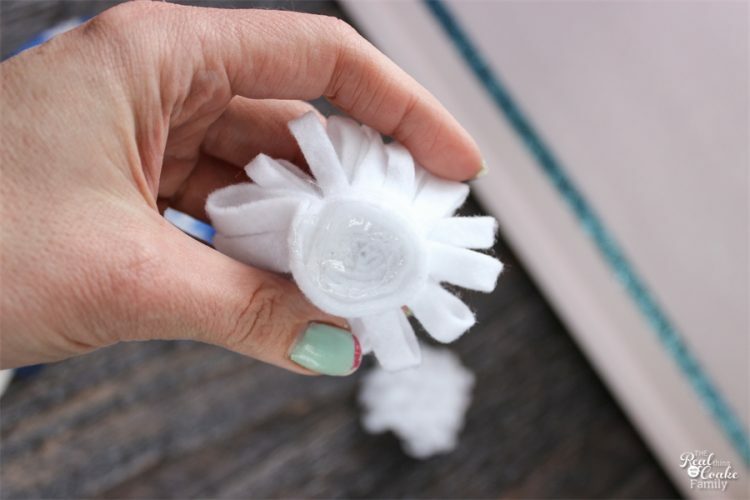 Place a good amount of hot glue on the back of the flower and add it to your bulletin board. I had a really hard time photographing this bulletin board and getting the White Sparkle Tulle to show up well. It is so pretty in person! You can see all the sparkle and glitter. It looks really great. Unfortunately, this was the best full shot I could get (and I'm not super happy with it). The little flowers look so cute and of course the glitter and tulle are lovely and fun. 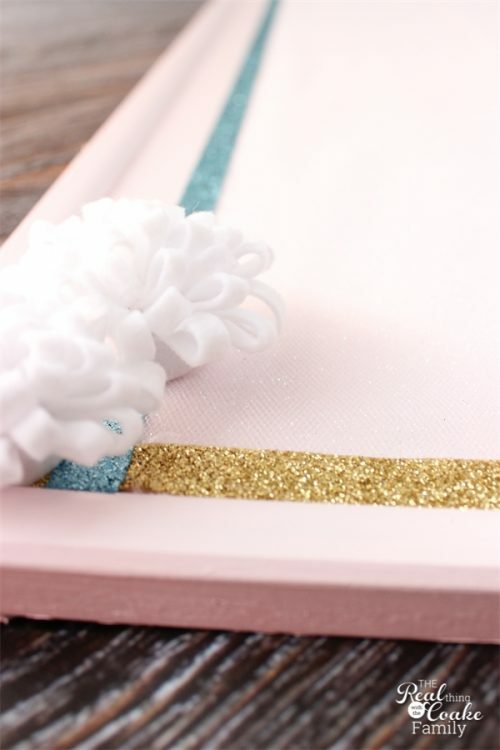 I love that I can take a brown bulletin board and supplies I have on hand and create something so pretty and different for my daughter's room. This bulletin board was not a challenging project, but it did take some time. Not even so much time all at once, but rather the waiting for paint to dry type of time. Then maybe 1 hour to add all the Offray tulle and ribbon. I'll have more for you from her room makeover later this month. I've got two more projects to show you… a pillow and PBTeen knock off wall art. 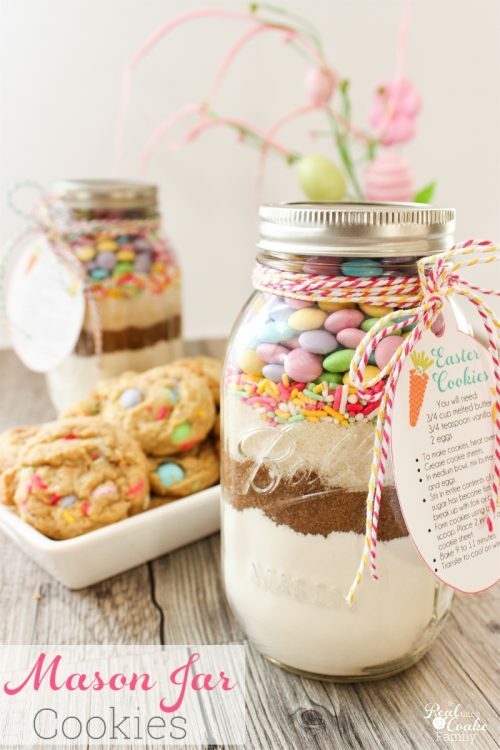 that turned out so cute!! I love the color and the glitter. Pinned it!